Baked Beans. Burgers. Typical cookout staples, right? Once upon a time, I never had any idea that they could be improved upon. Then a little fairy Godmother served these at a get together on a silver platter. Ah-mazing! I savored every bite. It was an intense, but brief affair. The clock struck 12, and just like that they were gone. The magic faded, but even after the party I couldn’t forget about them. It took some tracking down, but I found the maker of the magical beans, and there was no going back. This became a dinner, and cookout staple. Obviously, our family lived happily ever after in the kingdom of Beef & Beans. Debut this cookout season in style. Be the belle of the ball by bringing these babies. P.S. I’ve gotta tell ya, that these are great slathered on a hamburger bun too! 1. Preheat oven to 350 degrees. Coat a 9×13 casserole dish with cooking spray and set aside. 2. In a large skillet, heat the oil over medium heat. Add the onion; cook about 5 minutes or until softened. Add the beef; cook about 10 minutes or until brown, breaking meat up with a fork as it cooks. 3. 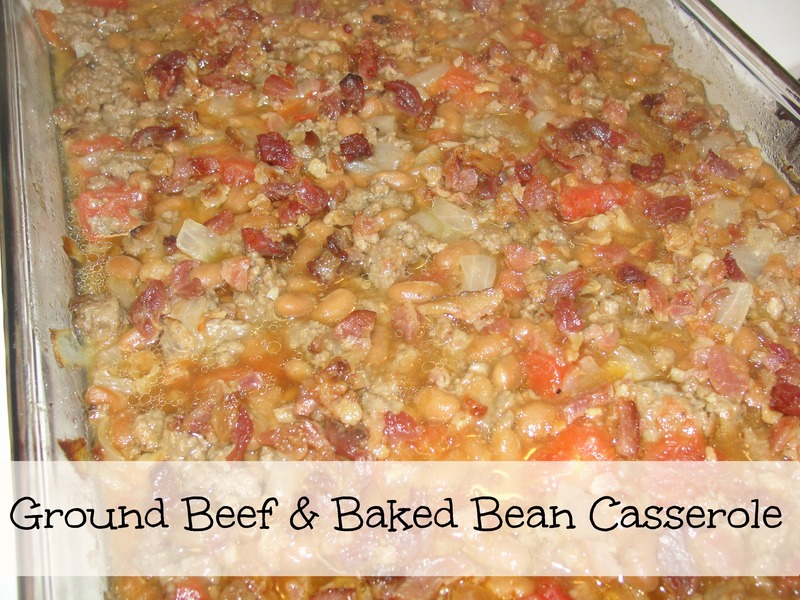 In a large bowl, combine the beef mixture with the remaining ingredients except the bacon; mix well. Pour beef mixture into the prepared casserole; arrange the bacon slices on top. Cover with a lid or aluminum foil. Bake about 45 minutes or until thick and bubbly. Uncover dish and preheat broiler. Broil for 1 to 2 minutes, or until the bacon is nice and crisp. These pork chops will melt in your mouth. They are so good and easy to prepare and assemble. They are first sauteed in butter, then baked, before being served smothered in a creamy mushroom gravy. Doesn’t that sound fantastic? My mouth’s already watering just typing up the recipe. These pan seared chops come out tender and juicy. Mmm, pork chops and gravy… it certainly doesn’t get much more southern than that. Wherever you’re from, this dish is guaranteed to ‘south’ your mouth. Serve them with some creamy mashed potatoes so you can be sure to savor every single drop of gravy, too! 1. Preheat oven to 350 degrees. In a large skillet over medium high heat combine butter, garlic, mushrooms, salt, pepper, oregano and thyme. 2. Once butter has melted, add your pork chops and seer on each side for 1-2 minutes until golden brown. 3. Once both sides of the pork chops are a golden brown place in oven and bake for 35 minutes or until centers are no longer pink. 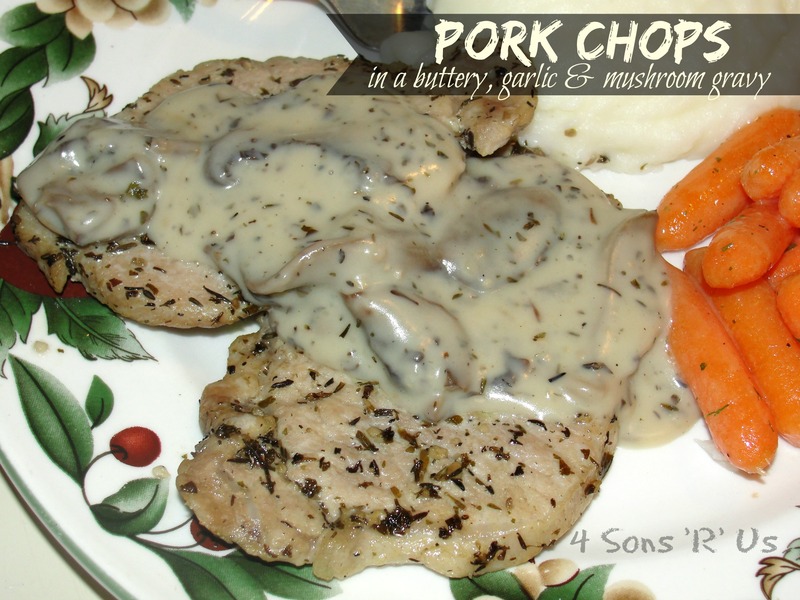 *Time may need to be adjusted depending on the thickness of your pork chops. 4. Remove skillet from oven and remove your pork chops and sit them aside to rest. 5. Whisk flour and milk into your pan with the remaining liquids after removing the pork chops. Whisk until all lumps are removed. Simmer for 3-4 minutes. 6. Serve over the top of pork chops.